First, let’s examine one-seeded dry fruits that are indehiscent (don’t split open at maturity). 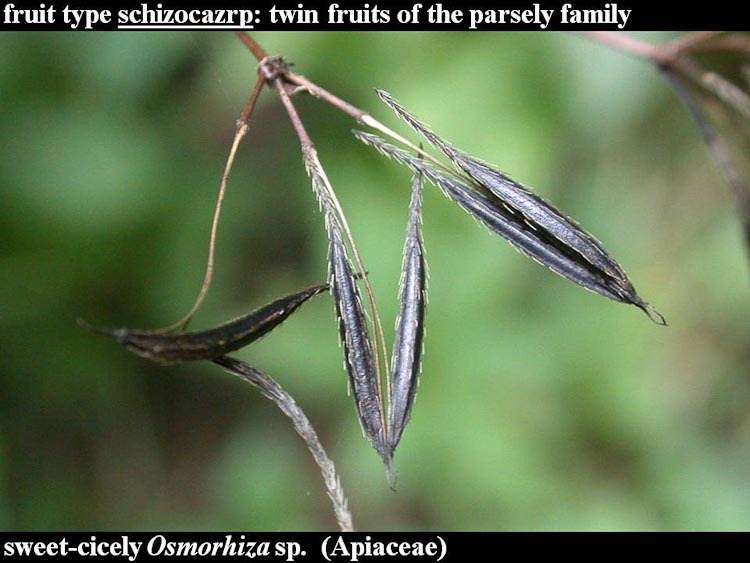 Most of these resemble, and are often casually referred to as, seeds. They’re not seeds; they’re fruits (with a seed inside). 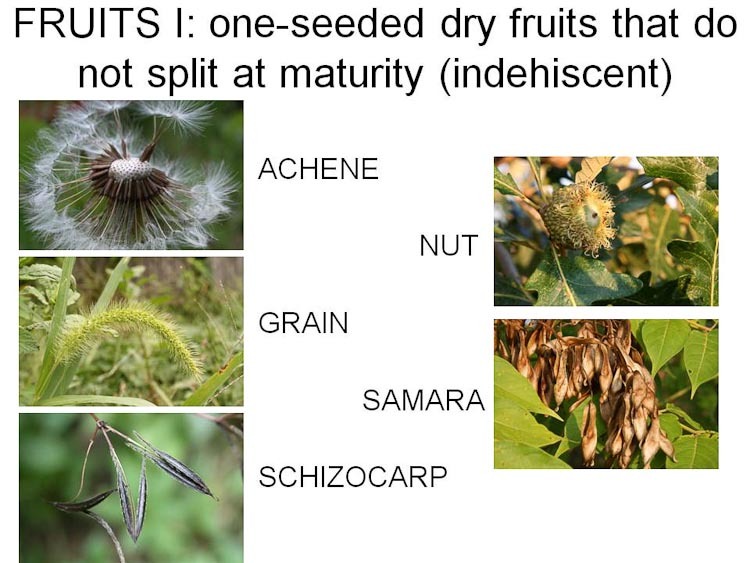 Overview of the most common one-seeded dry indehiscent fruits. 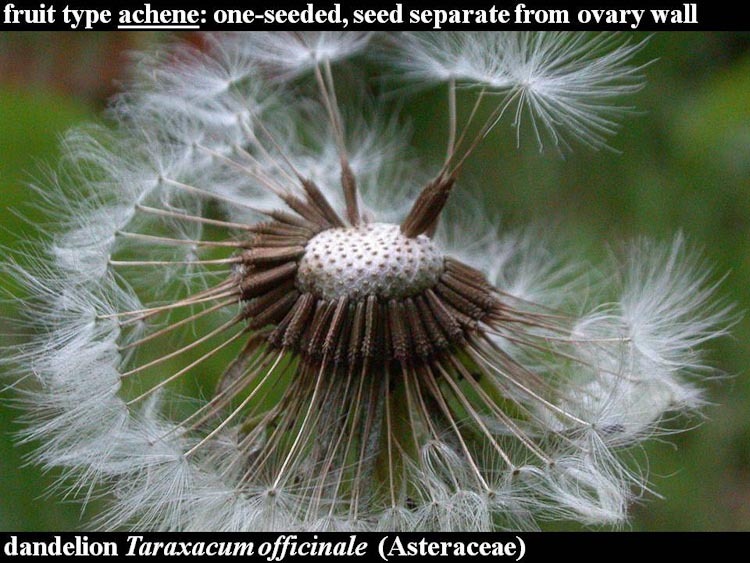 An ACHENE is a small, thin-walled one-seeded dry indehiscent fruit. 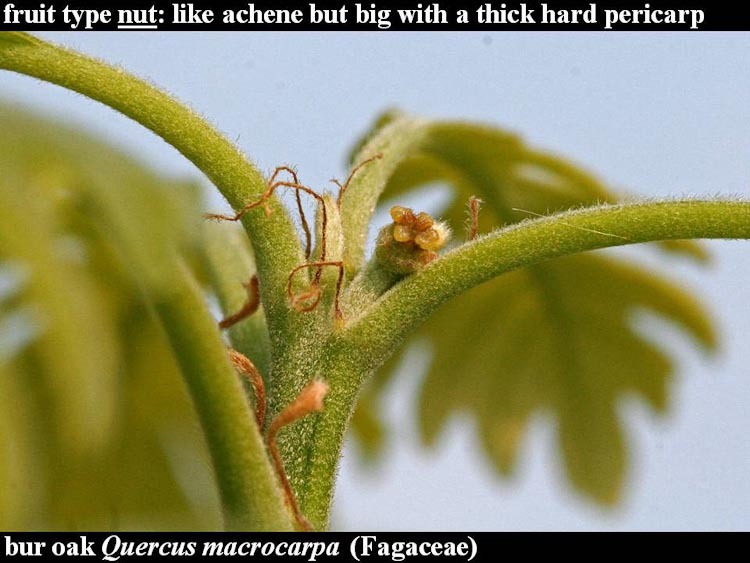 It is a very common fruit type, and the one most likely to be mistaken for a (somewhat chunky) seed, given that it is nothing more that a seed along with an additional thin covering, the “pericarp” (ovary wall). It is the fruit type of our two biggest plant families –the aster family (Asteraceae) and the sedge family (Cyperaceae), and is found in many other families as well. Below, a dandelion head in fruit. Dandelion is a member of the aster family and, as such, has what appears to be a single blossom but is actually a head-like cluster of many individually small flowers. Hence, in fruit, the dandelion head is many small fruits. The individual fruits are achenes. Or not. (See below). SLIDE the image to see dandelion in flower. 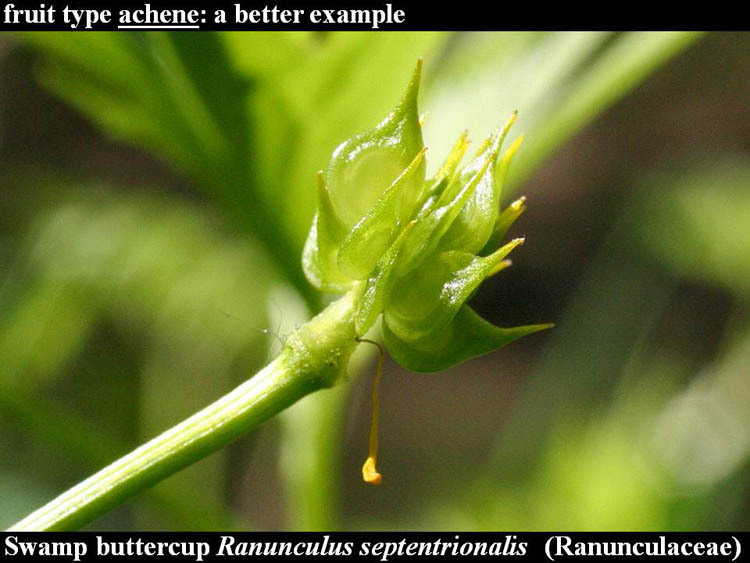 Below, swamp buttercup, and a more technically correct example of an achene. Note that, here again, we see many small fruits clustered together. This time however, the achenes are derived from the separate carpels of a single flower (which therefore has an apocarpous gynoecium). 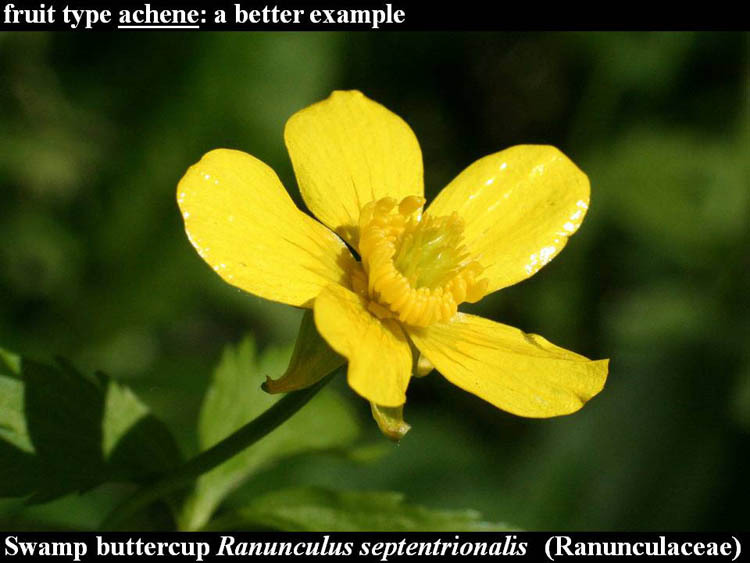 SLIDE the image to see swamp buttercup in flower. 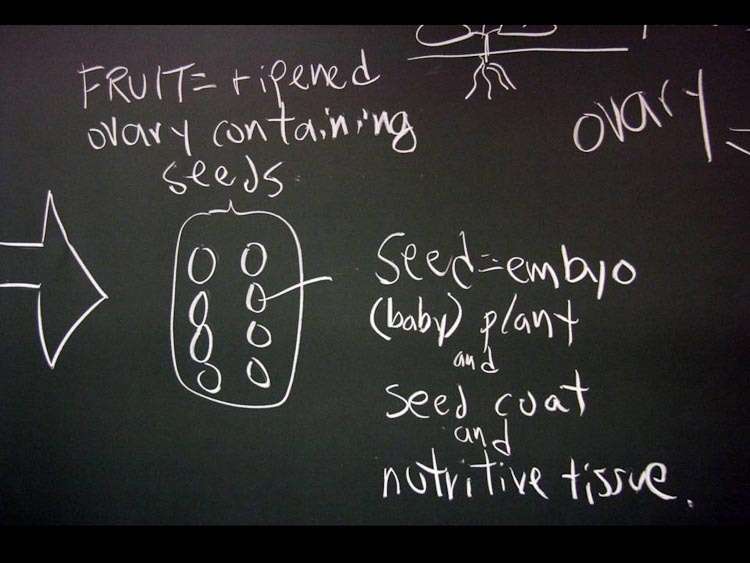 Like the clypsela, a few other, more widely recognized one-seeded fruits are best understood as being modified achenes. A NUT is like an achene, but larger, and the pericarp (ovary wall) is thick and bony. Below, see bur oak. Like the closely related chestnuts, acorns are nutritious and were an important food source for native Americans. They (red oak group acorns especially) contain bitter tannins that can be leached out by boiling in water that is changed several times. 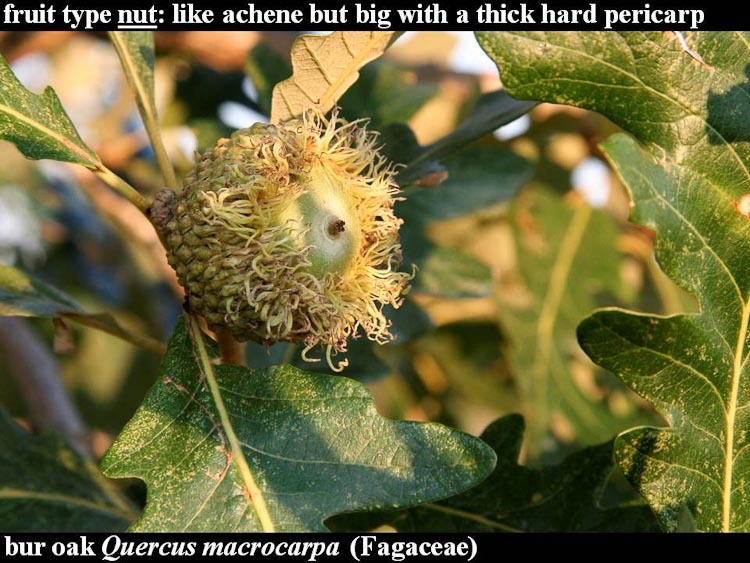 SLIDE the image to see bur-oak in flower. 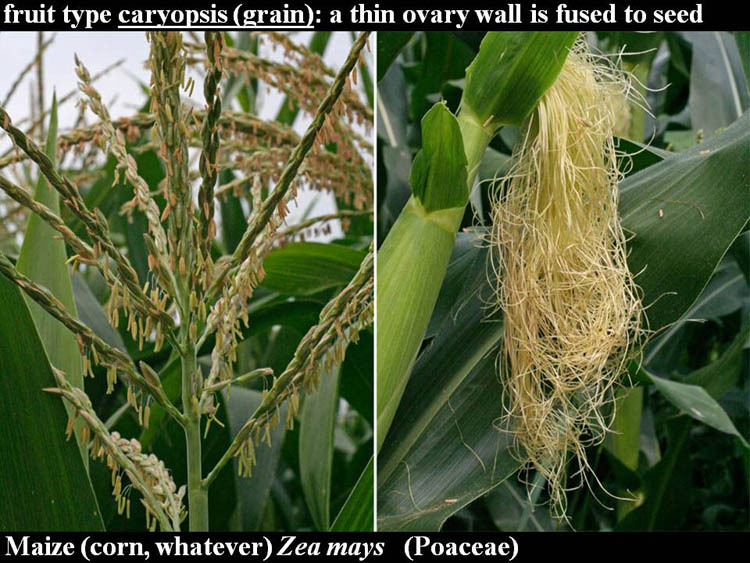 A GRAIN is like an achene, but the pericarp (ovary wall) is papery-thin and tightly adherent to the seed. 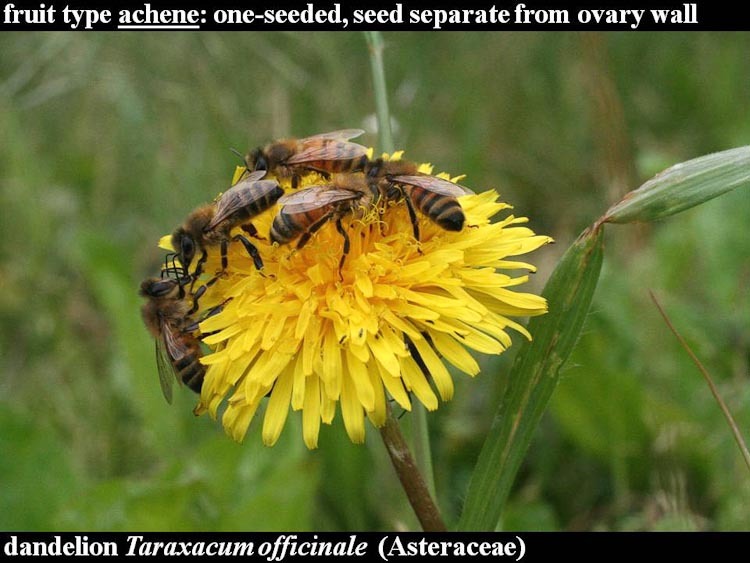 You cannot crack open a corn kernel and remove a seed the way you can with a sunflower achene. The coat may be milled off, as when white rice is manufactured by the processing of brown rice. The grain is a fruit in one family only, but what a family! The grass family (Poaceae) is very important because grasses are major components of many ecosystems, and grass fruit forms the basis of practically all agricultural economies, as rice, corn, barley, oats, wheat, and millet. 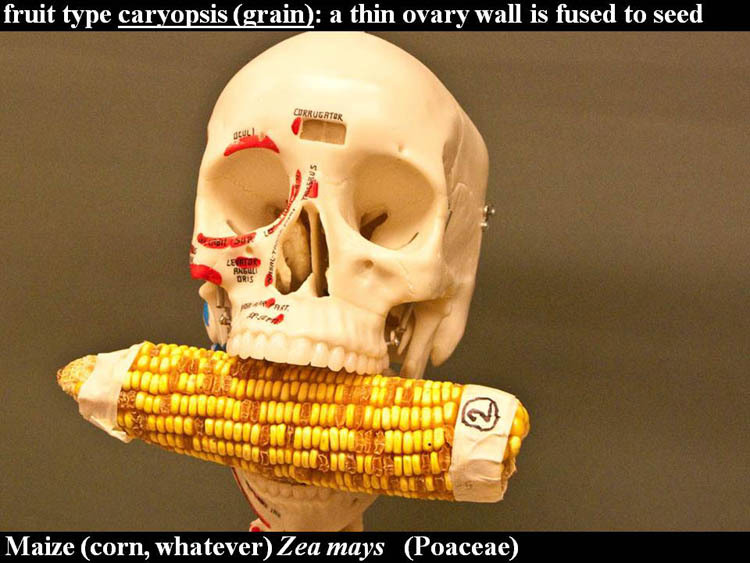 Lookey below, why, it’s maize, also known as corn, used in genetics classes to teach about Mendel’s laws of inheritance. The grain is the fruit of the grass family (Poaceae). 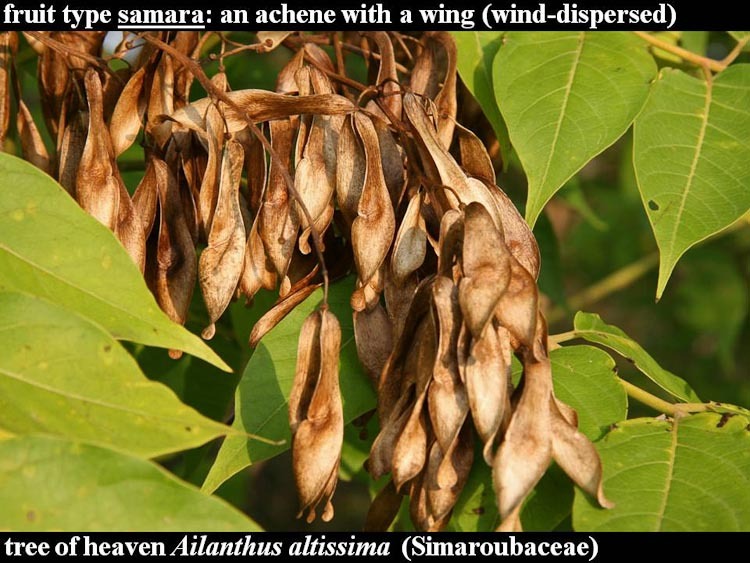 A SAMARA is an achene with a wing, enabling dispersal by the wind. 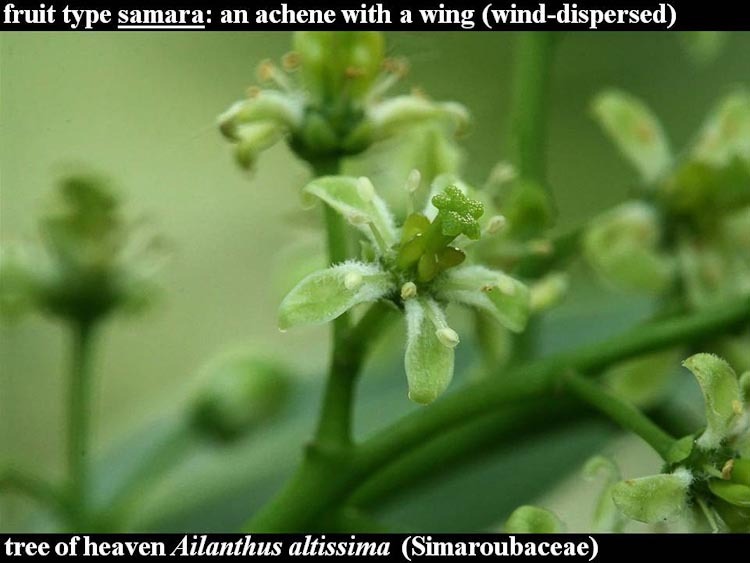 The whirlybirdy/helicoptery fruits of ash, elm, and maple are familiar examples os samaras. Below, observe tree-of-heaven, an obnoxious Asian weed. It grows very fast. “The tree that grows in Brooklyn” is tree-of-heaven. SLIDE the image to see a tree-of-heaven flower. Tree-of-heaven fruits are twisted samaras with the seed in the center. 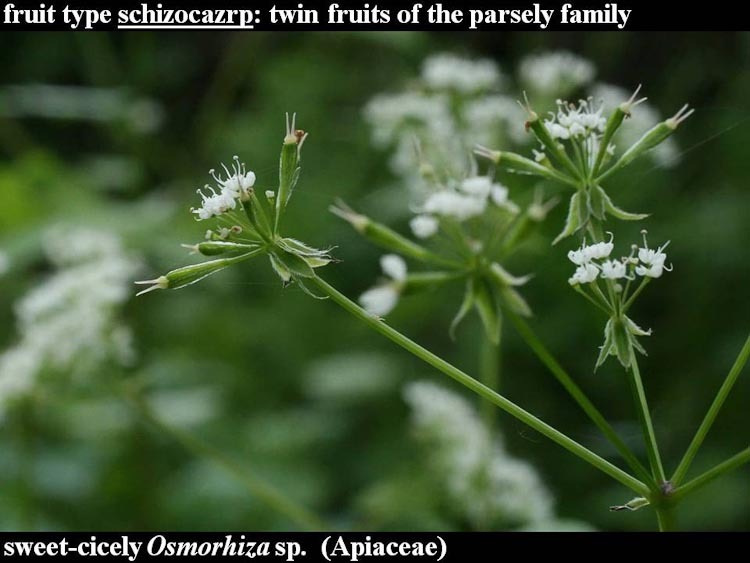 Another one-seeded fruit that often gets mistaken for a seed is a peculiar one found mainly in the parsely family (Apiaceae). Numerous examples can be seen on the spice counter at the local grocery store. 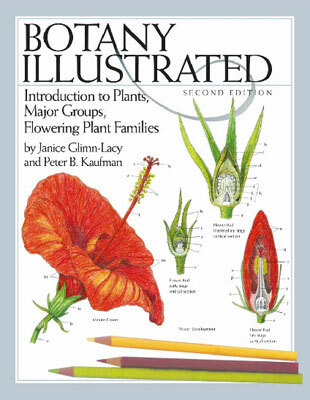 with beautifully informative, botanico-anatomically correct labels. 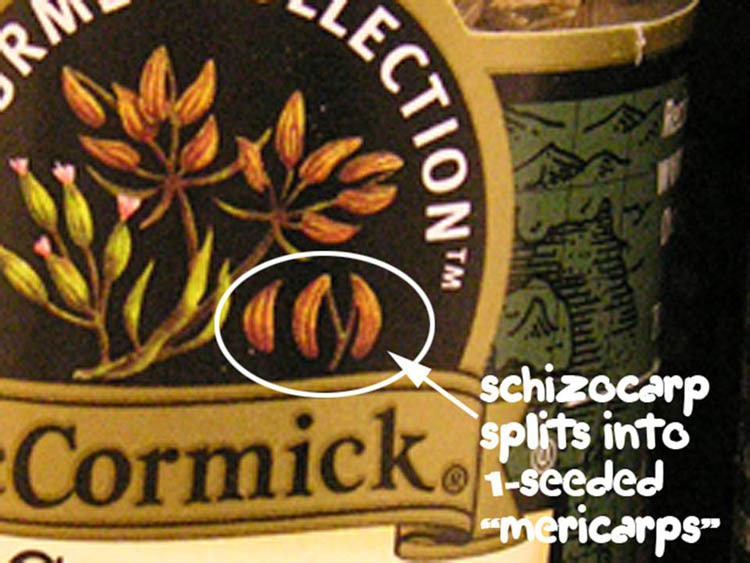 The sweet-cicely fruit is a schizocarp that separates into one-seeded mericarps.